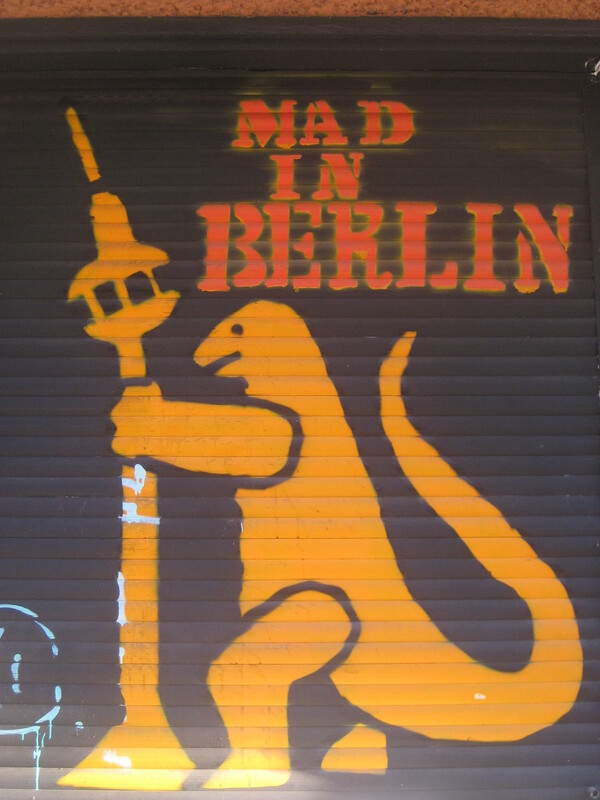 Since my first trip to Berlin in August 2014, I have been desperately looking for an opportunity to return. When Dr HH was first offered a job in Prague, we immediately got online to see how long it would take to travel to Berlin (5 hours on the coach via Dresden, just so you know). And at last in February we made it back. We only had 29 hours there, so it was quite the whirlwind trip, and of course we mostly filled it by eating. 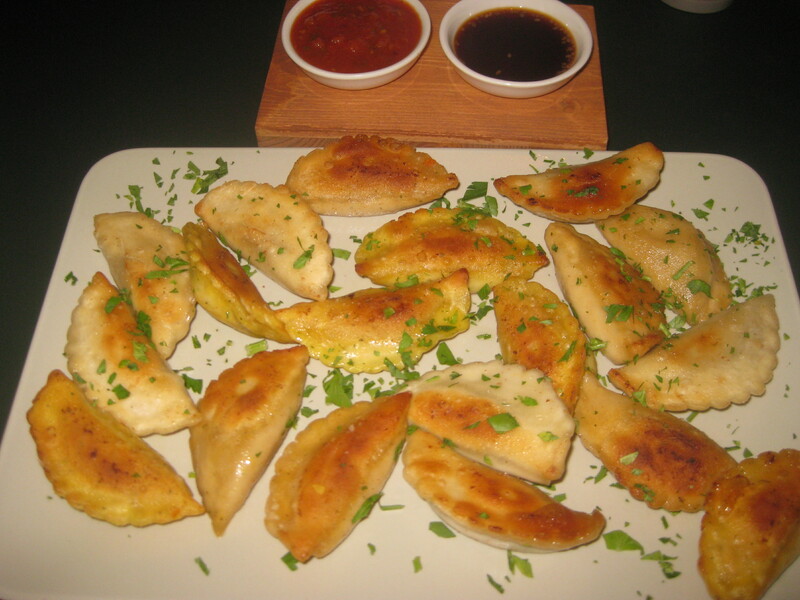 Fresh off the bus and feeling pretty peckish, we went directly to Momos for some Nepalese dumplings. We ordered the large plate of 18 to share. You can choose three different fillings (there are 4 vegan options) and two dips (only two vegan options). They can be steamed or fried: obviously we got them fried. We had the pumpkin ones, mushroom and potato, and spicy Indian ones. The latter were the best. Part of the fun was guessing which filling each dumpling had. The crispy side was so beautiful. The soy sauce dip was pretty unremarkable, but the spicy tomato one was excellent. Momos is a small place (one table for six inside, plus two little tables for two, and outdoor seating for when it warms up) and it doesn’t have a toilet on the premises. It’s definitely a winner for me though! The food is fast and tasty, service was friendly, and there are vegan desserts too. We didn’t stick around for those though – we had our eyes on a bigger prize. 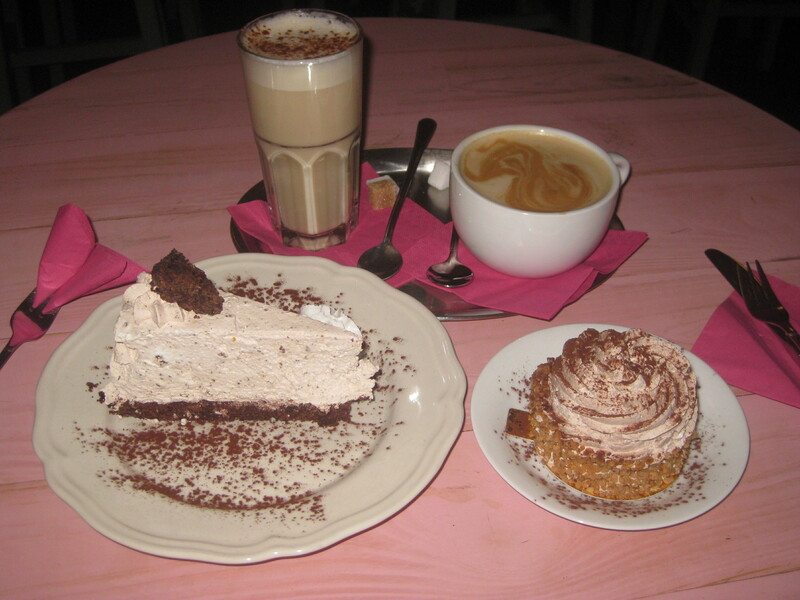 Yes, it was time to return to Oh La La, the most perfect little vegan cafe in the world with its breathtaking patisserie. 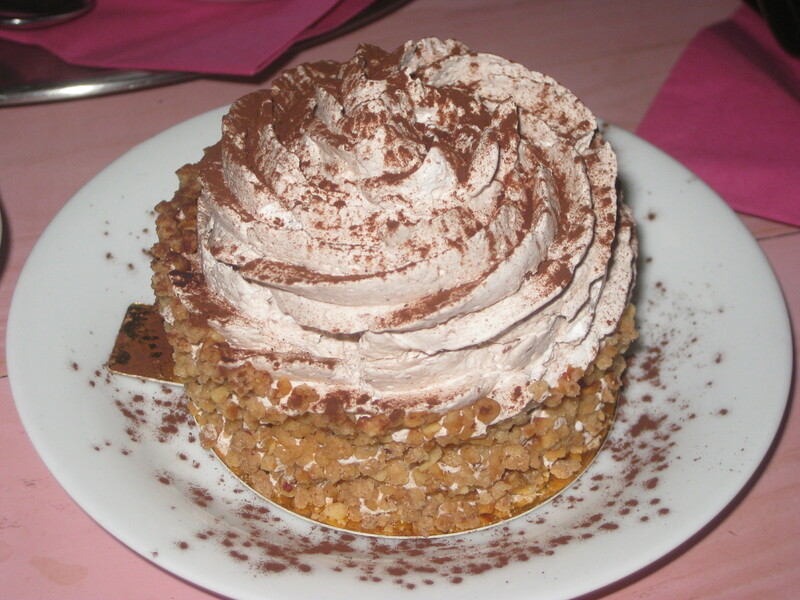 It was a tough choice, but eventually we agreed to share a slice of brownie and cream cake, and a tresor. 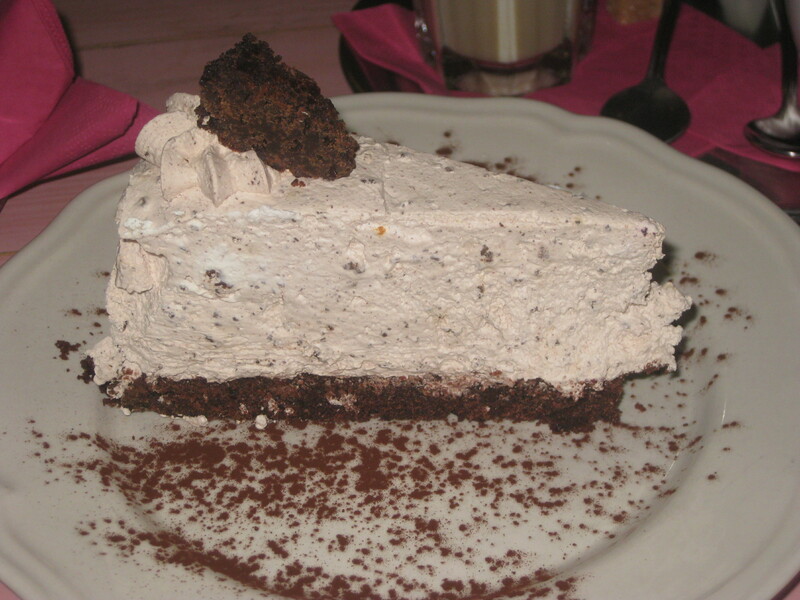 The cake was very good: the brownie base was really chocolatey, and the cream was so light. 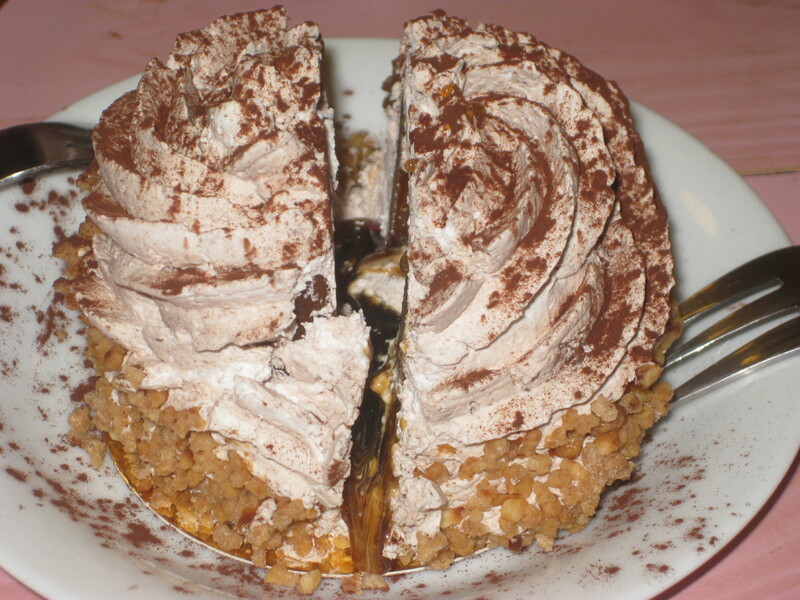 We laughed at the little swirl of whipped cream on the side – more cream really isn’t necessary with this. It’s sublime. The stuff of dreams. 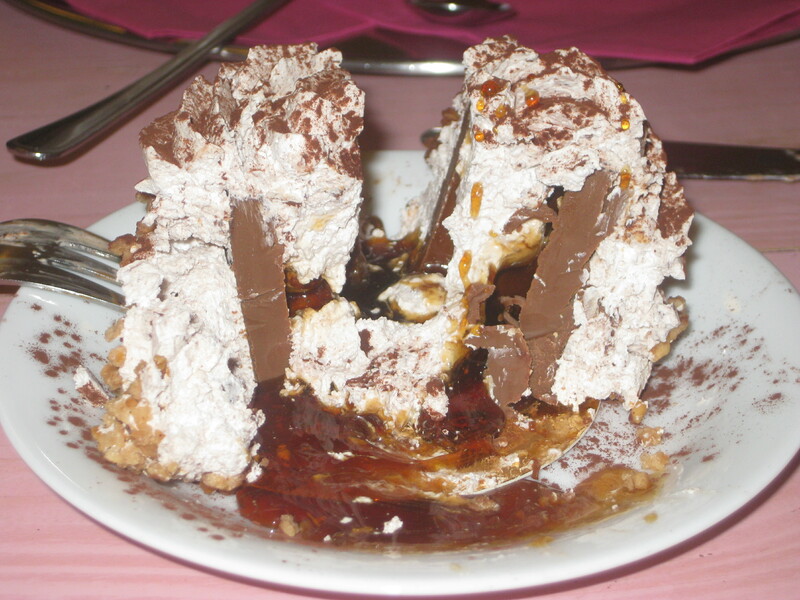 Dr HH described it as a giant rolo (chocolate shell filled with caramel sauce) covered in cream and coated in chopped hazelnuts. That’s pretty accurate. It was so good. With bellies full of cake, we reclined and sipped our hot drinks and debated trying to squeeze in something else, before eventually admitting that we didn’t need more cake and heading off into the wilderness. I hope we’ll be back soon. It’s probably worth doing a one-day ten hour round trip for these cakes, they’re that good. Eventually we were ready to eat again and we went for something a little different this time. In fact, we went for Vietnamese food! Prague has a sizeable Vietnamese population, and a wealth of Chinese vegan options (Loving Huts, basically), but nothing Vietnamese and vegan that I know of, so I was very excited about this. I lived in Ho Chi Minh City for 2.5 years, so I love any food that transports me back there. I didn’t really try that many of the classic Vietnamese dishes when I lived there though, because I could never tear myself away from the crispy, perfect little spring rolls. 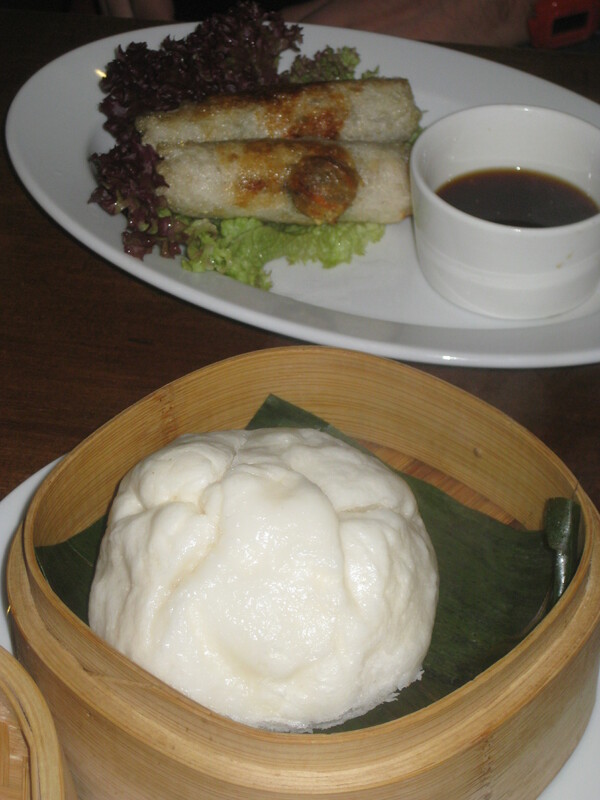 So of course, in Quy Nguyen I ordered spring rolls – but also branched out and got a banh beo, or steamed dumpling. Both were delicious (I shared with Dr HH, I wasn’t just really greedy). The fillings had plenty going on (veg, spices and mock meat). We also split the mains 50/50. 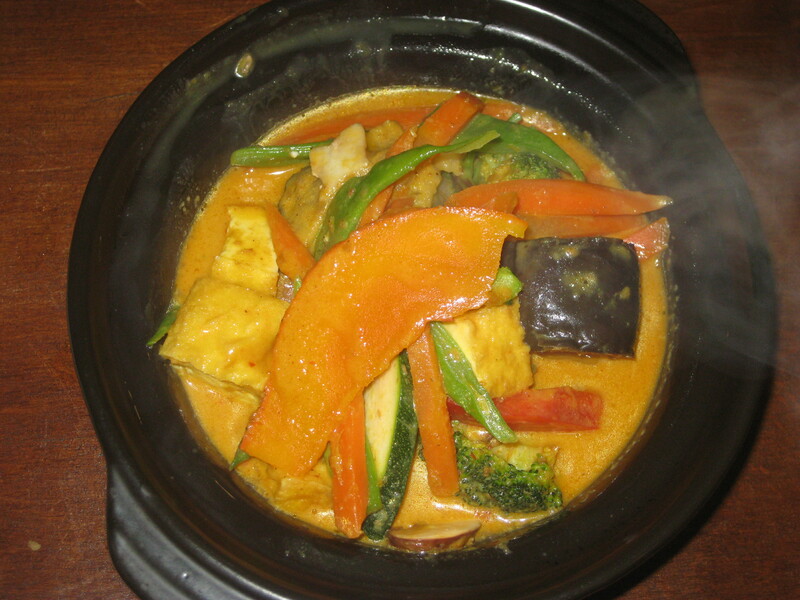 The com cary was a really flavoursome coconut curry with some nice tender aubergine chunks and plenty of tofu. 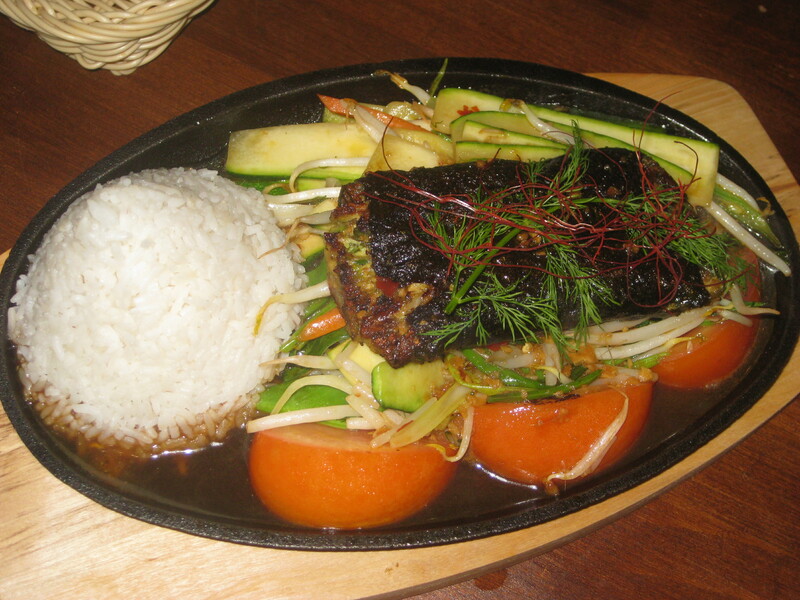 But the real standout was the cha ca: marinated tofu wrapped in seaweed and served with rice and various vegetables. The tofu was just amazing, and completely unlike anything else I’ve ever had. I love it when I encounter something completely new like this. I would really recommend Quy Nguyen. It’s quite a small place (though again, no toilet – you have to go into the bar next door), and they also do takeaway. The website is all in German, but they do in fact have English menus. All in all, it was a fantastic, if exhausting, trip. Hopefully we won’t wait too long before doing it again. Oh La La is calling to me! 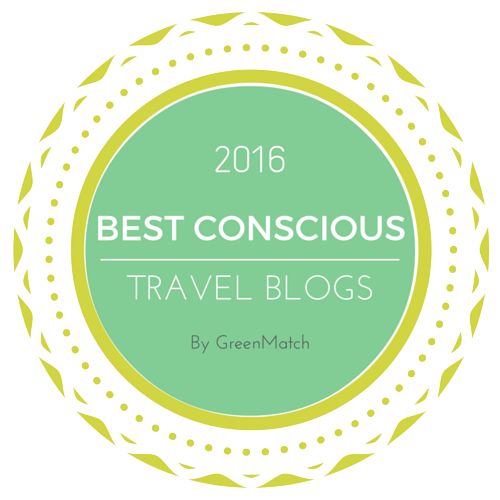 This entry was posted in Travel and tagged Momos Berlin, Oh La La Berlin, Quy Nguyen Berlin, vegan Berlin, vegan travel. Bookmark the permalink. Now that is 29 hours well spent! I’m so jealous of your tresor! I think 29 hours eating tresors would have been the best way to spend it! Yay! So glad you had fun in Berlin, I love it there and Oh La La has been my fave’ spot for many years. I would love to find a vegan Vietnamese place! It looks so good!